Our cabin is located on pristine property, secluded but not isolated, on the side of one of the Balsam Mountains. A 'Bold Rushing Creek With Our Own Private Island' flows just below our cabin. Fresh mountain air, crystal clear water, sun rays streaking through the tree tops. Comfortably furnished with antiques, art work and family treasures. A place to ponder the universe and one's place in it. Come stay with us and rejuvenate your soul. 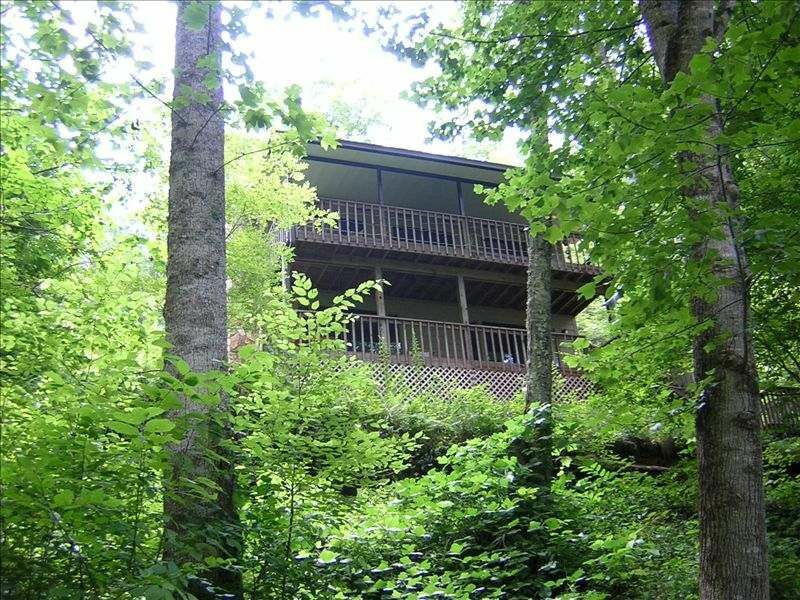 We are located within the Nantahala Forest surrounded by woodlands with wildlife of every description. Butterflies, humming birds and wild flowers abound. Listen to the water cascading over the rocks and boulders below while sitting on one of our decks. A peaceful, serene tranquility will overcome you. A wood burning stone fireplace and authentic hand made rustic hickory furniture will enhance your mountain vacation experience. A Lazy Boy chair, couch and rockers provide maximum comfort for your peaceful escape. Full size bathrooms on each floor offer maximum convenience. Although we have air-conditioning it is rarely used. Our guests prefer to leave sliding glass doors & windows open allowing the cool mountain air to flow through our cabin. Baseboard heating thru out our cabin provides exceptional comfort in colder weather. We have the internet with excellent reception anywhere on our property . . even on our own little island! Our living room has a magnificent view of the forest outside. Our kitchen is fully equipped with everything you need. Just like your own home. Our extraordinary dining table is made from old barn siding. We have 6 authentic Hickory dining chairs plus a divider bar with 2 stools between kitchen & dining area. We have Direct TV with excellent reception. We have a DVD player for your enjoyment. An extensive selection of books & reading material, including local information, is provided. We have a selection of games and puzzles for good old fashioned entertainment. Two long decks overlooking our creek are absolutely wonderful. Everyone enjoys an exceptional view of our 'Bold Rushing Creek' & private little island below. We are located 2.2 miles away from the nearest heavily traveled highway. Our country paved road will lead you to our peaceful rustic cabin in the forest. A bold rushing creek cascades over rocks and boulders just below our cabin. Enjoy your own private trout stream with a foot bridge to our own little island. Children and adults alike love finding "fools gold" in our creek bottom. My family of six spent five nights here. We had a wonderful time while at the cabin playing games, enjoying the wood-burning fireplace, relaxing in the rockers on the porch and eating. The cabin is secluded and peaceful with a rushing river below it which sounds amazing. When we ventured out, we were within 30 miles of everything we wanted to do; skiing, hiking, shopping, dining out, etc. Well worth it! Beautiful wooded cabin. Clean and comfortable. Kitchen and baths well stocked. Would definitely recommend and will go back. This cabin is very spacious and authentic. We loved the fireplace and the balcony/porch. We were out and about most of the time but when we got back in the evening, we were able to start a nice fire and relax. Having a stream running on the property was a nice bonus. It was beautiful and well priced. It was so much nicer than staying in a boring hotel. You’ll defiantly want to run the dehumidifier because there is naturally a lot of moisture in the hair. Keep in mind that cell signal is very weak up the mountain but they have WiFi which was very nice. We are looking forward to coming back next fall. The home met all of our needs and we especially loved the porches. Our four young children had a blast playing in the creek and on the island. The surrounding area is beautiful and peaceful. The town is only a few miles away so we enjoyed an evening out to dinner and ice cream. We enjoyed our weekend! A great place to rest and relax. It has everything you need for an enjoyable stay. We enjoyed our stay at this cabin. The cabin was clean and we loved the porch with rocking chairs. There was a wonderful view of the loud rushing creek. The temperature was perfect and stayed in the 60s during our mid July stay. The only bedrooms were downstairs which could be a problem if you have trouble going up and down stairs. Our stay was very relaxing! We are pleased you enjoyed your stay. The stairs to our bedrooms below are carpeted, have a comfortable landing & substantial hand rails. Folks of all ages can easily navigate our stairway without difficulty. Blue Ridge Parkway, Cherokee Indian Reservation, Great Smoky Mountain National Park, Great Smoky Mountain Railroad, Balsam Mountain Inn, Western Carolina University, Maggie Valley, Ashville - Biltmore Estate & Historic Grove Park Inn, Bryson City - Wild Water Rafting On Nantahala River, Waterfalls, Gem Mining, Trout Fishing On Our Very Own Creek ! Footbridge to our own little island . . children & adults alike enjoy finding 'fools gold' in the creek bottom. Pets Policy: We have a no pets policy. Cancellation Policy: 100% refund if cancelled at least 30 days before arrival date. *Higher night minimums during holidays & leaf season. *There is an additional guest fee of $10 per person, per night, when there are over 6 people.